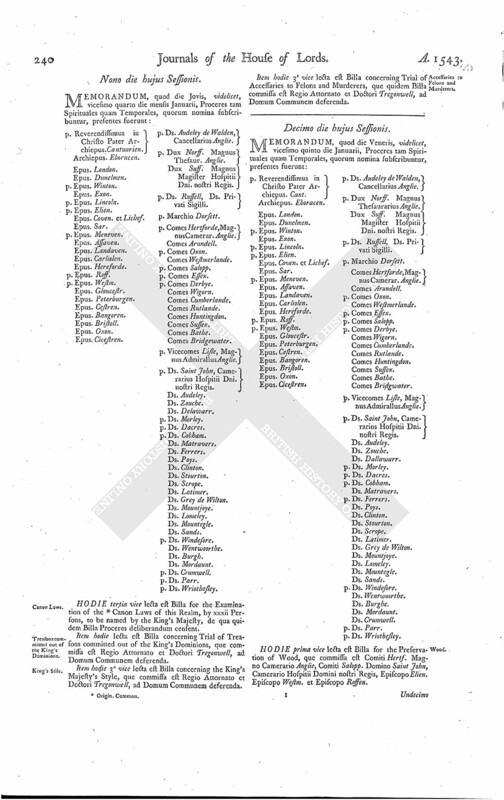 Treasons committed out of the King's Dominions. Accessaries to Felons and Murderers. Epus. Cicestren. p. Ds. Audeley de Walden, Cancellarius Anglie. p. Dux Norff. Magnus Thesaur. Anglie. Dux Suff. Magnus Magister Hospitii Dni. nostri Regis. p. Ds. Russell, Ds. Privati Sigilli. p. Comes Hertforde, Magnus Camerar. Anglie. p. Vicecomes Lisle, Magnus Admirallus Anglie. p. Ds. Saint John, Camerarius Hospitii Dni. nostri Regis. HODIE tertia vice lecta est Billa for the Examination of the (fn. 1) Canon Laws of this Realm, by xxxii Persons, to be named by the King's Majesty, de qua quidem Billa Proceres deliberandum censent. Item hodie lecta est Billa concerning Trial of Treasons committed out of the King's Dominions, que commissa est Regio Attornato et Doctori Tregonwell, ad Domum Communem deferenda. Item hodie 3a vice lecta est Billa concerning the King's Majesty's Style, que commissa est Regio Attornato et Doctori Tregonwell, ad Domum Communem deferenda. Item hodie 3a vice lecta est Billa concerning Trial of Accessaries to Felons and Murderers, que quidem Billa commissa est Regio Attornato et Doctori Tregonwell, ad Domum Communem deferenda.